....with his brothers yet. He needed to test them still. Were they still the same mean brothers who sold their little brother just to make a few bucks? Or had they changed? Did they still only care about themselves and what they wanted? That's what Joseph needed to find out. And so his brothers were waiting for the Governor of all of Egypt to come home. They had their gifts laid out. The palms of their hands were sweaty. What was going to happen next? When Joseph walked into the room, his brothers bowed low to the floor - just like Joseph's dreams again, the ones his brothers had laughed at! Your servant our father is very much alive and well, the brothers answered - and they bowed low to the ground again. And then Joseph saw his brother Benjamin. Remember, Benjamin was Joseph's little brother, and he had missed his baby brother very much (even though he wasn't a baby anymore!). Is this your brother Benjamin? Joseph asked, still pretending he didn't know them. May God bless you! Joseph said to his little brother, and then tears began to fill his eyes. He had to run from the room before his brothers could see him cry. When the tears finally stopped, Joseph washed his face and went back to his brothers. Lets eat! he said. He clapped his hands, and immediately his servants began to bring in great platters of food. Now, Egyptians thought they were better than everyone, and they would never even think of sitting down to eat with Hebrews. Why are people always thinking they are better than other people? God loves each of us just the same - and more than we could ever know! So the Egyptians in Josephs household ate at one table, while the eleven brothers ate at another. Joseph ate at a table all by himself. But then, to his brothers' complete surprise, Joseph got up... and served them himself! The Governor of all of Egypt was serving THEM - and all the best stuff from his own table! Well, it's just like the God of the universe gives us the best stuff from HIS table every day! It is an amazing thing! The brothers were seated by their age, the oldest to the youngest - and as Joseph served them, they couldnt believe what was happening. They hardly even noticed that Joseph gave his brother Benjamin five times as much as anyone else. You can be sure, if they were at home and any one of them got as much as one BITE more than the other, there would be trouble. You know how that goes! But the brothers were so amazed at their good fortune, and having such a wonderful time at this great feast, they didn't even notice. How strange. Here they thought they were going to be in big trouble, and instead, they were invited to a feast! I wonder if thats how it is with us. Sometimes we are sure God must be mad at us (and sometimes for good reason! ), but He loves us so much, and is so forgiving, He really is preparing a great feast for us instead. When they had finished, Joseph gave these instructions to his steward, Fill the mens packs with as much food as they can carry - and then put each mans silver back in his pack. The next morning, just as the golden light of a new day was beginning to fill the sky, the brothers loaded their packs on their donkeys and started for home. What are you talking about? the brothers said when Josephs steward had caught up with them. Oops! Remember, they had promised their father that nothing would happen to their brother Benjamin - and the cup was in his pack! They each lowered their packs to the ground, and the steward began searching them. He started with the oldest and went one by one, oldest to youngest, until he came to Benjamin. 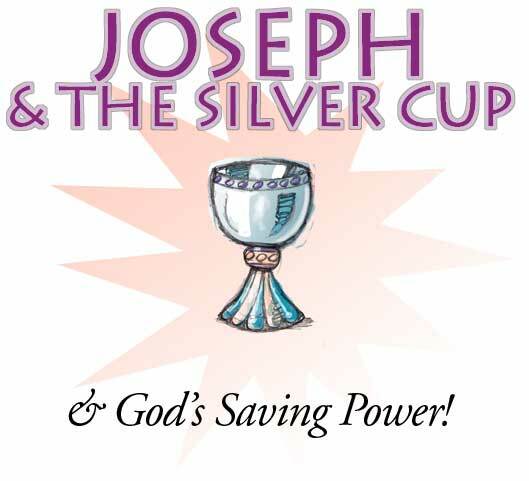 Benjamin opened his pack - and there was Joseph's silver cup! There was only one thing they could do. They had to go back and plead for Benjamins life. Joseph was still at his home when Judah and his brothers rushed in and threw themselves to the ground at Josephs feet. But Judah begged him, Please sir! I am only a humble servant, and you are as great as Pharaoh himself, but may I say something? Once his brothers sold their brother Joseph into slavery - but now they were willing to become slaves themselves to keep their brother Benjamin safe. Before, they were willing to let their father think Joseph was dead, and now they would do anything to keep from hurting him again. They really had changed. They really did care. When his servants had left, and Joseph was alone with his brothers, he broke down and cried so hard and so loud that everyone in his house could hear. But his brothers were terrified. They could not say a word. And then he told them, There are still five years of famine to come. For another five years the earth will be dry as bones, and no food will grow. But God told me everything that was going to happen, and I have stored up grain for us all. Dont you see? You didnt send me here, God did! It was all Gods plan from the very beginning. God sent me on ahead to save his people! With tears of joy in his eyes, Joseph threw his arms around his brother Benjamin, and then his older brothers too. He forgave them for everything they had done. Through all the years, and all his troubles, God was really at work, doing an amazing, wonderful thing! Even though what Josephs brothers did WAS a terrible thing, Gods love and forgiveness is so great that he took a terrible thing and turned into a great blessing! Many, many years later, there will be another cup, in another story. This time, it will be the cup Jesus drinks from at the Last Supper. And just like God sent Joseph, God will send Jesus on ahead to save his people - you and me! Just like Joseph's brothers turned against him, Jesus's own people will turn against Jesus too. They will put him to death on a cross. But God will turn that terrible, terrible day into the best thing to ever happen in the history of the world. Three days later God will raise Jesus from the dead! Jesus will rise from the dead, and everyone who believes in him will live with Him forever! It is all part of God's amazing, wonderful plan to save His people - you and me!